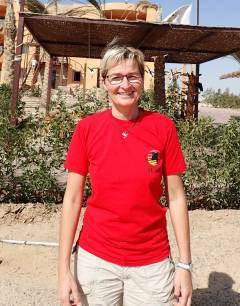 Claudia Rebelein is now the new manager of Sharm El Naga / Soma Bay! "I've been in Egypt since the beginning of 2017, but it feels like I've been here for a long time, because I've been so warmly welcomed that I could feel at home The Red Sea have fascinated me from the first visit, so I have now fulfilled a long - cherished wish, here in Sharm el Naga I like the quiet environment and the location far from the hustle and bustle I have been developing an online travel agency in recent years, so I know what our guests are expecting from their holidays and what details it is all about Knowledge, combined with lots of fun and commitment, I would like to contribute to my new task. I am looking forward to a (very good) cooperation in the team of the Extra Divers Sharm el Naga, lots of sun and a great season!" Our second newcomer, Detlef England, will take care of a flawless process in Brayka Bay / Marsa Alam from now on. "My name is Detlef England is 53 years old and I was born in Wuppertal, the beautiful Bergisches Land in NRW, I have been living in Egypt for 17 years now and I feel very comfortable here In Kenya with a Schnuppertauchen in the pool. I was aware after a short time that I had found my passion. During my vacation I then still completed the CMAS * diver and then continued my continuing education up to the CMAS *** dive instructor in Germany. 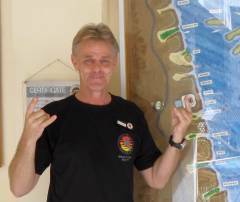 In 1996, I became acquainted with the PADI system in the Seychelles and continued to train myself up to the PADI Course Director. I am delighted that I have been part of the Extra Divers team since April 1, 2017 and have been able to take over the divecenter management of the Extra Divers at the Brayka Bay Reef Resort, and on my assignments, especially on all our regular and new guests With my team here in the Brayka Bay sincerely welcome and some wonderful dive." We wish the two a great start and all the best!! !